TV talk show panelist ready to go for a water safety episode! GREAT LAKES, USA – The Great Lakes Surf Rescue Project (GLSRP) works with family and friends of drowning victims to advocate water safety in the Great Lakes region. It has assembled a “Drowning Panel” and an outline for a talk show water safety episode. The World Health Organization states that drowning continues to be a neglected public health issue. Why? Why does drowning continue to be a neglected public health issue that gets very little attention and very little funding? The GLSRP believes it’s because there’s a Viscous Cycle of the Drowning Epidemic. The nation is facing a drowning epidemic. And even though a few key people and nonprofit organizations have dedicated their lives and personal money to raise water safety awareness, a lot of their efforts are still not reaching their target audiences. The show will also feature GLSRP executive directors to discuss their accomplishments and the work that still needs to be done despite funding constraints; e.g. a nationwide water safety school curriculum. In schools today there are fire drills, tornado drills, school shooter drills, and even earthquake drills, but very little water safety education. Unfortunately though, more school age children in the united states will die drowning each year than in fires, tornadoes, school shooters, and earthquakes combined. So why is there no Water Safety School Curriculum? Any additional topics the Talk Show would like to introduce. Vicki Cech – In 2003 Cech lost her son, Andy Fox, 16, in Grand Haven, MI. Cech was recently featured on the Steve Harvey Show for her water safety accomplishments in –Grand Haven, MI. Cech received the 2014 NDPA national community lifesaver of the year award. Associated Press Coverage. Kathy & John Kocher– In 2013 the Kocher’s lost their son, Matthew, 15, in Lake Michigan at New Buffalo, MI. Kathy & John have recorded a video about his loss and have hosted over 40 Great Lakes Water Safety School Presentations in Illinois. John Kocher is currently serving on the GLSRP Board of Directors. Melissa Zirkle – In 2013 Zirkle lost her son, Jermaine Marcus Zirkle, 13, in Lake Erie at Saybrook Township Park, Ashtabula, Ohio. Melissa has hosted over 20 Great Lakes Water Safety School Presentations in OH. Melissa also won the 2015 NDPA Lifesaver of the Year Award. Melissa is currently serving on the GLSRP Board of Directors. Susan Baker Foster – In 2013 Foster lost her son, Benjamin McCarter, 31, as he swam near Kenosha’s North Pier. The city of Kenosha is on considering installing life rings on its pier. Jamie Racklyeft – In 2012 Racklyeft survived a drowning accident in Leland, MI. Shortly after he was rescued, Brian Rolston, 16, drowned in a rip current at the same beach. (Jamie TV Interviews 08/01/2013). Jamie is currently serving on the GLSRP Board of Directors. Dave Benjamin, survived a drowning accident (video) and that was his inspiration to co-found the GLSRP and serve as Executive Director. Bob Pratt, water safety expert, GLSRP Executive Director of Education. (Bob TV Interviews 02/08/2012, 08/05/2012). Bob Pratt also won the 2012 NDPA Lifesaver of the Year Award. Dana Suskind & Genevieve Liu – In 2012 her husband and father, Dr. Donald Liu, drowned in Lake Michigan. Daughter Genevieve Liu created SLAP’D – Surviving Live After a Patent Dies. Michelle Radke & Hanna Radke – In 2014 husband and father, Peter Radke drowned in Lake Erie. Hanna created a blog titled, “Above the Waves”. Nancy Verhey – In 2012 Verhey lost her brother in-law, Karl Schmidt, 61, in Lake Michigan at Sheboygan, WI. The drowning accident happened during a family reunion at the beach. Approximately 30 family members witnessed the rescue and resuscitation efforts on the beach. 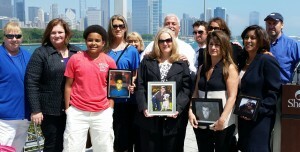 Jeri Rolston – in 2012 Rolston lost her son, Brian Rolston, 16, in a rip current in Leland, MI.